It is a historic moment in science on April 10 when scientists released the first ever image of the black hole, the center of our Milky Way galaxy. About 40 billion kilometres away from the earth, the Sagittarius A* has been described as 'a monster' by scientists. It was captured by the Event Horizon Telescope (EHT), made of about 8 radio telescopes. 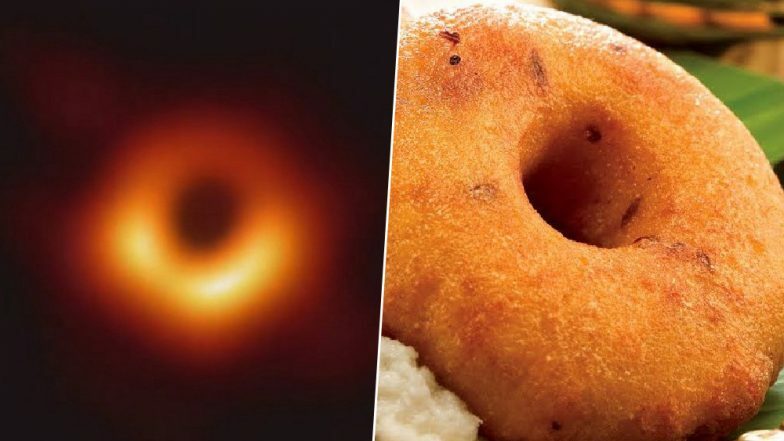 It is one of the most astonishing yet confounding picture for many and like any new thing that goes through the trend of making memes, the black hole memes are also up on social media. Funny jokes and memes are being made on this fascinating object in the universe. First Photos of Black Hole Released! Watch Video With Images of Black Hole Found in Galaxy Called M87. The Black Hole looks like an out of focus image but it was an extremely tedious process to make it. It is a flame-orange halo of gas and plasma. The image was revealed to the public with simultaneous conferences held across the world. While it may have been a great breakthrough in the field of science, for the online community it was a matter to make memes. Black Hole or Cat Eyes? Or is it a donut? No but its a medu wada! Doesn't it looks like South Indian Vada 😂. Most people have related the picture to their favourite food items. While it may seem like just a blur orange ring, it is a big step in the field of science. The universe is vast and we have managed to capture some very important element of it.